Prentissvale from the ridge separating Oil Valley and Tram Hollow. The area of Otto Township was created in 1854 from territory of Eldred Township and experienced an oil boom in the late 19th century. 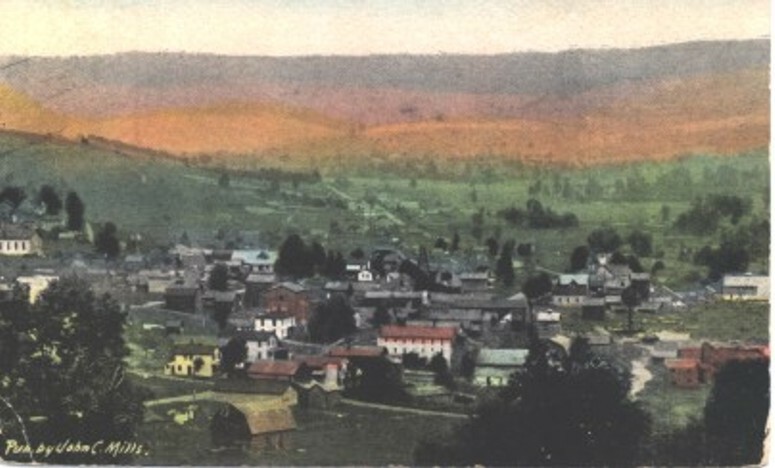 The village of Duke Center today was once a large borough of roughly 2,800 inhabitants in the 1880s. Due in part to the discovery of oil in Duke Center and Rixford two years prior. Before that the area was little more than a lumber camp and some farming took place too. Mr. Prentiss was one of the earliest settlers coming to the area in 1845 and farmed in the area now known as Prentissvale and was their first postmaster. Benjamin Bunker came in 1852 and John Duke came to the area about the time of the Civil War with his brothers Charles and Thomas. Chauncey Root also resided on the site of Duke Center before the war. Land sold for $4.00 an acre around Duke Center at this time. Other early families included the Bryants, Spragues, Baldwins, Gridleys and Lovejoys to name a few. Only known as Otto Township at the time, John Duke bought large parcels of land and was ambitious to make a village here and in 1871, he took the opportunity of the publication of a county map, laid out the village of Duke Centre and at his own expense had it published in the county map. Hence, Duke Centre was officially recorded. The post office was started in 1878 and W.H. Randall the first postmaster. The village would be incorporated as a borough in February of 1881 and M.M. McElwain the first burgess. Somewhere in between then and today the 'old English' spelling of Centre was changed to Center. Building lots on Main Street sold for $100 to $300 per lot. Oil producers purchased land from farmers and lumber men at prices above $600 per acre. A nice profit considering their original investments. Transportation to Duke Center was to say the least an adventure in itself. A great deal of materials were hauled from Eldred and the mud and swamps so deep that it generally took four horses three days to make a round trip. Most of the teams made the trip by running the creek bed because it was mostly stone bottomed. The need of transportation became so great that a wooden plank road was built from Duke Center to Eldred. In 1877 the Kendall & Eldred narrow gauge railroad was built from Eldred to Bradford and this train brought modern transportation to the region. One could make the trip by train to Bradford through Duke Center and Rixford in less than two hours. Duke Center like so many other towns was made mostly of wooden buildings and fires would take no mercy against the villages. The decreasing oil production would lead to Duke Center's eventual decline as a major town in the county. Growth at one point during the oil boom was second only to Bradford city. Today Duke Center is a quiet residential village and one would not know it's great oil history and size because little exsists of the original Main Street.